Throughout much of the English-speaking world, the Roman Catholic Church is preparing its priests and parishes for the most significant changes to the Mass in the more than 40 years since the church permitted English in place of the Latin. The new Roman Missal will be used starting in November, but some priests are campaigning to prevent or delay the change. The changes are included in a new English-language translation of the Roman Missal, a translation produced after almost 30 years of labor, intrigue and infighting. The new missal, the book of texts and prayers used in the Mass, is intended to be closer to the liturgical Latin that was used for centuries than the current version. The church officials promoting it say it will bring an elevated reverence and authenticity to the Mass. Many Catholics who prefer a more traditional liturgy are eagerly anticipating the change. But after getting a glimpse of the texts in recent months, thousands of priests in the United States, Ireland and Australia have publicly objected that the translation is awkward, archaic and inaccessible. 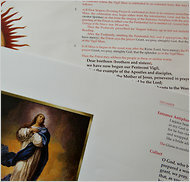 Although most are resigned to adopting the new missal, some have mounted campaigns to prevent it from being introduced. American Catholics will first encounter the new missal on Nov. 27, the first Sunday of Advent, the start of the liturgical year and the season leading up to Christmas. Even bishops and church officials in charge of preparing the way for the new language in the Mass acknowledge that it will take some adjustment — especially for priests, who will have to master complicated new speaking parts. “The first time I saw some of the texts, I was shocked,” said the Rev. Richard Hilgartner, who as executive director of the American bishops’ Secretariat of Divine Worship is overseeing the introduction of the new missal in the United States. One of the most noticeable changes is in the Nicene Creed, the statement of faith that Catholics learn to recite as children. 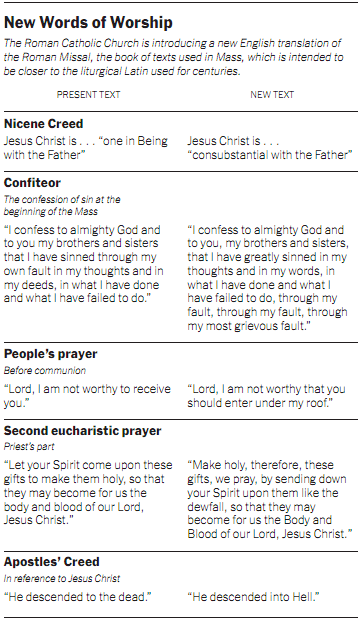 Currently, Catholics say that Jesus is “one in being with the Father,” but in the future they will say that Jesus is “consubstantial with the Father.” This is one of several changes that include unfamiliar vocabulary. Church leaders say that this new choice of words is not only less casual, as befits a greeting to a priest, but is also consistent with the language used in the Catholic Mass in French, Spanish, Italian and German. A universal church, they say, should have the closest thing possible to a universal missal. The new missal is the product of a long tug-of-war over liturgy, which began with the decision of the Second Vatican Council to make the Mass more accessible to Catholics by allowing churches to replace the Latin with the local vernacular. Bishops in the English-speaking world set up the International Commission on English in the Liturgy to share the monumental task of translation. By 1973, they had produced a new missal, but many experts in liturgy agreed that it was hastily done and required revision. The commission continued its work, and produced texts that did not always adhere tightly to the Latin, but instead aspired to what it called a “dynamic equivalent.” The commission also strived to use language that it considered more gender neutral. Those efforts were upended in 2001, when the Vatican issued “Liturgiam authenticam” (Authentic Liturgy), an instruction requiring that translations of the Mass adhere literally to the Latin vocabulary, syntax, punctuation and even capitalization. And the Vatican appointed a committee it called “Vox Clara” (Clear Voice) to advise the translation efforts, but it gradually took on a more supervisory role. After 10 more years of often-contentious back and forth, the final text was issued by the Vatican in December, Father Hilgartner said. But even before it was finalized, the early reviews were often startlingly negative. The Rev. Michael Ryan, pastor of St. James Cathedral in Seattle, started a petition asking to delay the introduction of the new missal. The petition, called “What if We Just Said Wait,” has been supported by more than 22,000 priests, nuns and laypeople around the world, some of them prominent liturgists, theologians and musicians. Only about 10 percent asked to be anonymous; the rest signed their names. More recently, the association of priests in Ireland and a much smaller group of priests in Australia also called on their bishops to hold off on introducing the missal. And the Rev. 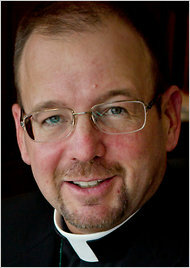 Anthony Ruff, a Benedictine monk and a professor of liturgy at St. John’s University in Minnesota, wrote an open letter to the American bishops saying he was canceling his engagements to speak in eight dioceses at sessions designed to familiarize priests with the new missal, because he could not in good conscience support it. Father Ruff served as head of the music committee of the international commission working on the translation, but said he was removed in November for posting negative comments about the new missal on his blog. The missal has already had a test run in South Africa, where the bishops said they mistook the instructions and introduced it a year too early. The Rev. Larry Kaufmann, provincial superior of the Congregation of the Holy Redeemer, was an early opponent of the missal in South Africa. “No one is saying that it’s improved the liturgy,” he said in telephone interview, “or that it’s more prayerful or solemn. It would be great if it were. I’d be the first to listen. “But no one is putting up a fight any more,” he said. As the orientation sessions in the American dioceses have continued, more priests who initially objected are accepting the change. In the Archdiocese of New York, two vicariates (or regional groupings) of priests withdrew resolutions expressing concern about the missal after attending an orientation session. © 2011 The New York Times Company. Reprinted from The New York Times, International, of Tuesday, April 12, 2011.